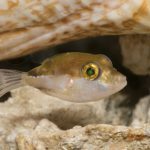 Pseudogramma is a diverse genus of miniature soapfish (AKA “basslet” or “podge”) that doesn’t get much attention from the aquarium community. 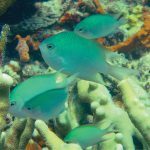 These small, drably colored fishes lead cryptic lives on tropical coral reefs, seldom venturing far from their rocky abodes in the wild. In captivity, they are about as secretive a creature as one can add to an aquarium, poking their heads out only to grab passing bits of food. While these certainly aren’t everyone’s cup of piscine tea, for those aquarists who can appreciate such a weird and enigmatic fish, today is an exciting day with the description of not one, not two, but three (3!) new species. The new species (P. brederi, P. galzini, P. paucilepis) were first noticed on account of their distinctive genetics, which was later corroborated with careful morphological study. 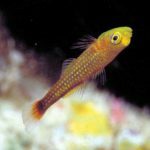 All three of the new taxa had previously been confused with a single widespread Indo-Pacific species, Psuedogramma polyacantha—a fish which does occasionally get collected for the aquarium trade. The diagnostic traits separating them are subtle and involve things like modal fin ray counts, relative scalation of the head and the relative length of the lateral line. In outward appearance, they all more or less look identical: pale, with a pattern of dark chainlinks along the body. 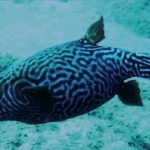 No, these reclusive fishes won’t be winning any ichthyological beauty contests anytime soon, but they’re kind of interesting nonetheless. And there is at least one species with a little pizzazz to it, Pseudogramma xanthus. Though it’s limited to the subtropical reefs of the South Pacific, this species has actually been collected for the aquarium trade. 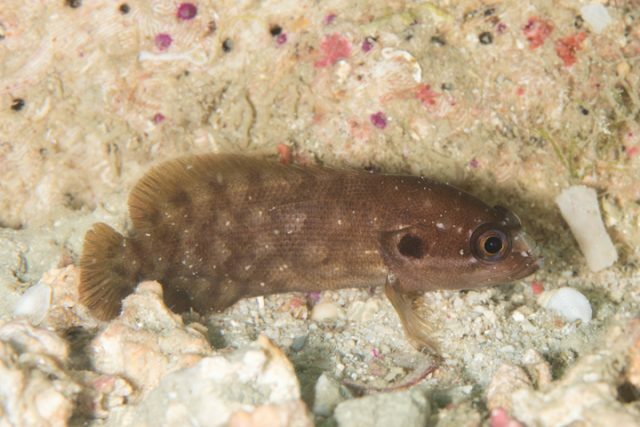 Quality Marine has made it available under the evocative name of Lava Basslet. 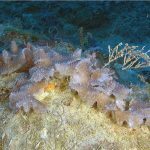 For more information on these obscure Polynesian Pseudogramma, check out the fine work of Williams & Viviani in the latest edition of Zootaxa.